Welcome to Dynamics Physical Therapy's patient resource about Adult Degernative Scoliosis. A normal healthy spine will be straight when seen from the front or the back. When seen from the side, the normal spine forms a gentle S curve. Scoliosis is an abnormal or exaggerated curve of the spine from the side or from the front or back. Adult degenerative scoliosis is different from the type of scoliosis that occurs in teenagers. Adult degenerative scoliosis occurs after the spine has stopped growing and results from wear and tear on the spine. The condition most often affects the lumbar spine. The spine is made up of 24 moveable bone segments called vertebrae. The spine is divided into three distinct portions. There are seven cervical or neck vertebrae, 12 thoracic or mid-back vertebrae and five lumbar or low back vertebrae. The spine is made up of three general parts. The top portion is the cervical spine and connects with the skull or cranium. The middle portion is the thoracic spine and is identified by the ribs that attach to each of the vertebrae. The lower portion is the lumbar spine. It connects with the pelvis at the sacrum. The vertebra stack on top of one another and are separated by discs. The spine has normal curves. 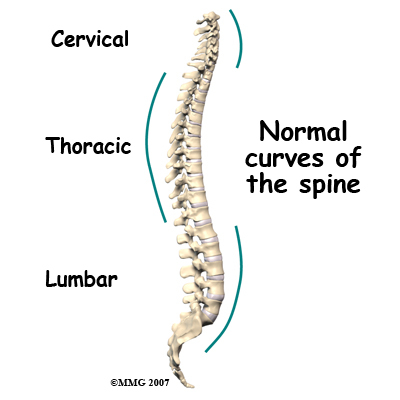 When looking at the spine from the side, the spinal column is not straight up and down, but forms an S curve. The cervical spine has an inward curve called a lordosis. The thoracic spine curves outward. This curve is called a kyphosis. The lumbar spine usually has an inward curve or a lordosis. The S curve seen in the side view allows for shock-absorption and acts as a spring when the spine is loaded with weight. This S curve maintains balance of the spine in a forward and backward plane. The spinal cord travels within a canal made by the vertebra. Branching off of the spinal cord are nerve roots. These nerves then supply arm, trunk, and leg muscles for movement. They also supply muscles of organs such as the bladder. Discs are fluid-filled cushions between the vertebrae. 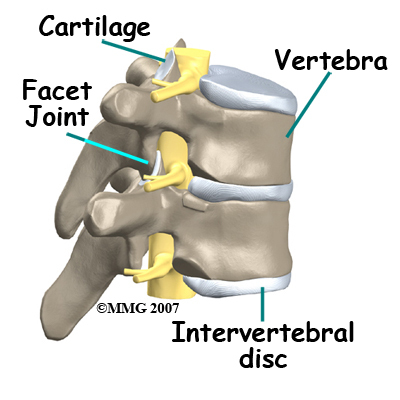 Facet joints are small joints connecting each vertebra in the back that allow movement. Facet joints are lined with cartilage. The cartilage is a covering of the joint surface that gives some cushion and protects the bone. It is also slippery which helps with motion. 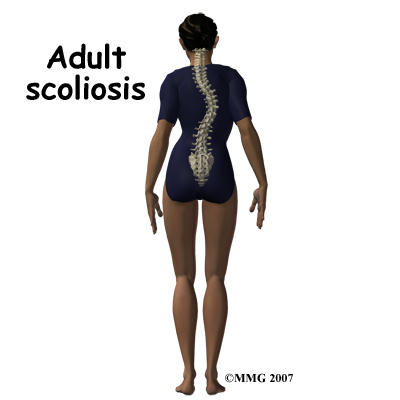 Adult degenerative scoliosis can be a result of scoliosis from childhood. The curvature may increase during adulthood and become painful. Scoliosis that happens in childhood is usually idiopathic, meaning there is no known reason for it. Any part of the spine can be affected by scoliosis including the cervical, thoracic, or lumbar vertebrae. Most often the lumbar spine is affected. The vertebrae curve to one side and may rotate, which makes the waist, hips, or shoulders appear uneven. The most common cause of adult degenerative scoliosis is from degeneration, known as wear and tear. It usually occurs after the age of 40. In older women, it is often related to osteoporosis. Osteoporosis is the loss of calcium in the supporting bone. This makes the vertebrae weak. 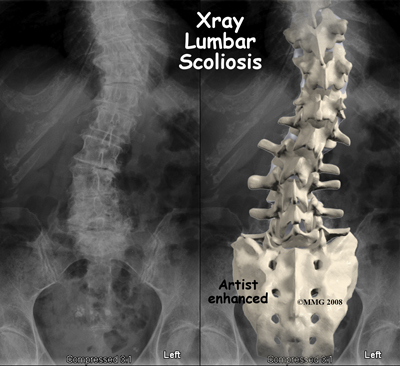 In adult degenerative scoliosis, the spine loses its structural stability and becomes unbalanced. This imbalance of the spine causes changes in the way the forces of the spine are directed. The larger the scoliotic curve becomes, the faster these changes cause degeneration of the spine. This creates a vicious cycle where increasing deformity causes more imbalance, that in turn causes more deformity. While this process occurs very slowly, it usually continues to slowly progress until something is done to restore the balance in the spine. When there is an S curve when viewing the spine from the front, the condition is called scoliosis. The scoliotic deformity may also affect the normal S curve that the spine has when viewed from the side. These curves are normal and required to maintain the proper balance of the spine. Many patients with scoliosis actually lose the normal curves of the spine. Our body has a natural tendency to try to maintain a balance where the head is straight above the middle of the pelvis. If one leg is longer that the other, and the pelvis tilts, the spine will curve in the opposite direction to place the head above the center of the pelvis. If there is a curve in a portion of the spine, then the remainder of the spine will bend in the opposite direction to try and keep the head above the middle of the pelvis. The scoliotic curve has a convex and concave side. The convex side is simply the outside of the curve where concave is the inside of the curve. The spine above and below the curve will tend to bend in the opposite direction in an attempt to balance the spine. Remember, the body will always try to place the head immediately above the middle of the pelvis. The concave side will tend to have more compression of the facet joints and possibly the nerve roots. This can lead to more pain from arthritis on the concave side of the curve and may lead to pain, weakness and numbness into the legs from the compressed nerve roots. These nerve changes are called radiculopathy. In adult degenerative scoliosis, there is gradual narrowing of the discs that cushion between the vertebrae. 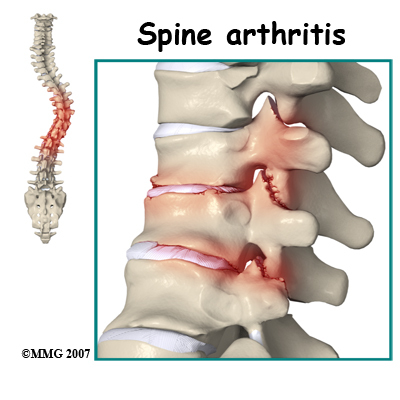 The cartilage and joint surfaces of the facet joints in the spine can wear out, causing arthritis. This can cause back pain. 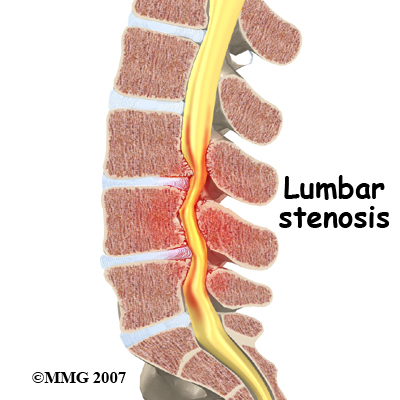 Stenosis is a term meaning narrowing. There are times when the canal for the spinal cord is narrowed. The openings for the nerve roots may also be narrowed. This will usually cause compression of the nerve structures. When the spinal cord or spinal nerves are compressed, pain, changes in feeling and/or motor function of the muscles can happen. 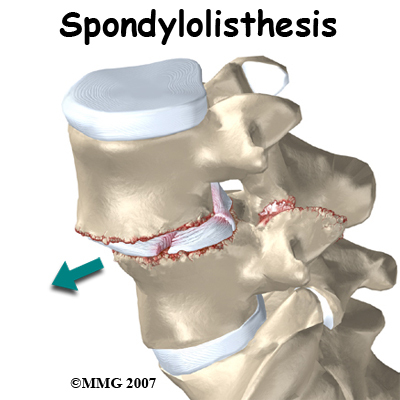 Sometimes spondylolisthesis occurs. This is slippage of one vertebra on the other. This can happen in adult degenerative scoliosis when the vertebrae do not stack on top of one another like they are supposed to. One vertebra may be shifted sideways or forward, not lining up as it should. The slippage is graded from I to IV, one being mild, IV often causing neurological symptoms. In rare and severe cases, the chest may become deformed because of scoliosis. This may affect the lungs and heart. This can lead to breathing problems, fatigue, and even heart failure. Degenerative scoliosis is more common the older we get. As our population ages, adult scoliosis will be even more common. It will be an increasing source of deformity, pain, and disability. What does adult degenerative scoliosis feel like? When you first visit Dynamics Physical Therapy, we will ask you several questions about your pain and function, what makes your pain better and worse, when it started, if there have been changes in bowel or bladder function, or changes in motor function, and whether you have had previous surgery. Our Physical Therapist will perform a physical examination that will include observation of your posture in standing position both sideways and from the front and back to assess for scoliosis. Mobility of your spine and hips, as well as walking ability will be evaluated. A neurological exam that includes testing reflexes with a small rubber hammer, and testing of sensation will likely be included. Most of the time treatment of adult degenerative scoliosis is conservative care, meaning non-surgical. Rarely is surgery necessary. Treatment decisions for adult degenerative scoliosis are based on how much pain you are experiencing, how much the condition is affecting your ability to function and whether or not you are having symptoms of nerve compression. When you begin Physical Therapy at Dynamics Physical Therapy, the first goal of our treatment is to ease pain and other symptoms so that you can resume and maintain normal activities as soon as possible. Activity modification such as limited lifting or avoidance of prolonged sitting or standing can be helpful. Occasional use of a cane or walker to improve walking tolerance may be recommended. Much of the pain from adult degenerative scoliosis is the result of muscle spasm. This spam occurs when the normal muscles must work harder than normal try to restore the balance to the spine. The muscles become fatigued and begin to spasm. This causes pain. At home, use of ice or heat may prove beneficial, and our Physical Therapist can provide you with guidelines for the use of these therapies. Physical Therapy is important for strengthening muscles of the spine, abdomen, hip girdle, and legs. Our Physical Therapist may advise you to participate in weight bearing exercises to help strengthen your bones and muscles. These may include activities such as walking, toning with the use of weights or other resistance, and tai chi. Stretching of certain muscles may also be recommended. Stretching or traction applied to the sides of the curve is sometimes used. Traction devices may also be tried, and are often available for home use. At Dynamics Physical Therapy we will teach you exercises that you can do at home, on a regular, ongoing basis. It may be possible to improve posture and motion. The goals of our exercise program will be to improve the flexibility of your tight muscles, strengthen your back and abdominal muscles, and to help you move safely and with less pain. Specific abdominal, or "core" strengthening will be very important to increase the stability of your spine and prevent further degeneration. Muscle stimulators may also be used to help train your muscles. These are battery-powered electrical devices that cause muscle contraction. The electrodes or patches are placed over a muscle such as along the spine. There are wires that then attach the electrodes to the device. The current is given for a limited period of time, controlled by a timer. This can help train the muscles to contract on their own. For pain management, your Physical Therapist at Dynamics Physical Therapy in Northern Virginia may place a battery operated electrical device (TENS unit) over the area of pain. This reduces painful input to the brain from your back. Bracing may also provide some help especially when the scoliosis is painful or unstable. Braces that are made to fit may be more comfortable and effective, but they are more expensive than off-the-shelf braces or supports. There are also unloading braces to help relieve pressure on the discs, nerves and joints of the spine. Patients may also want to consult with their doctor or pharmacist regarding the use of pain relief or anti-inflammatory medication to help you gain better control of your symptoms so you can resume normal activity swiftly. Over-the-counter anti-inflammatory medications such as Ibuprofen or Naproxenare often helpful. There are also many prescription anti-inflammatories available. In severe cases, narcotic medication may be considered by your doctor to make you more comfortable. If surgery was necessary for your adult scoliosis you will likely be hospitalized for several days following surgery. Some patients prefer to extend their stay in a transitional care unit in the hospital, or even a skilled nursing facility (nursing home). Your surgeon may suggest a brace following surgery to support your spine and ensure that you do not bend too far. You will be allowed to get in and out of bed and walk shortly after surgery. Lifting is usually limited during the initial recovery period. You will gradually be allowed to resume your usual activities after several weeks or months. It may be recommended that you have Physical Therapy after your surgery to help you regain strength and independence with daily activity. When you begin your Dynamics Physical Therapy post-surgical program, we will help you with activity modification, and possibly recommend equipment for use in your home that may be helpful. When you visit Dynamics Physical Therapy for your post-surgical rehabilitation, we will first focus on reactivating the affected muscle systems. You will be trained in exercises that will increase your core stability and functional stability of the area. If your condition allows, we will eventually have you engage in training specifically designed to help you return to your previous daily activities or your sport. Your surgeon will want to see you periodically to monitor your progress. Repeat imaging with X-ray, MRI or CT scan is usually done to follow the progress of your spine as it heals. Your doctor will want to start with x-rays to measure the degree of the scoliosis. X-rays provide pictures of the alignment of the vertebra. Using a device to measure angles held up to the x-ray image, the degree of curvature of the spine can be measured. These measurements are referred to as the Cobb angles. Diagnosis of scoliosis is made when a curve measures greater than 10 degrees. 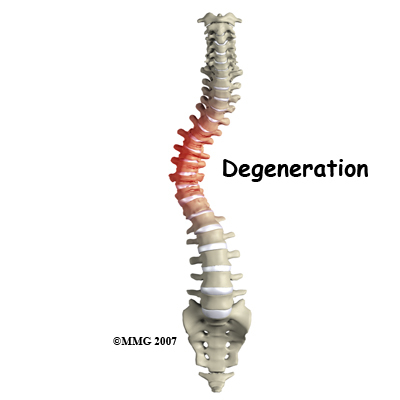 X-rays can also give your doctor information about how much degeneration has occurred in the spine. They show the amount of space between the vertebrae. They can also show the degree of fusion of the spine following surgery. If you are having pain into your leg(s), or difficulty with bowel or bladder function, your doctor will likely order a magnetic resonance imaging (MRI) scan. The MRI scan provides a better image of the soft tissues such as discs, nerves, and the spinal cord. The MRI machine uses magnetic waves rather than x-rays to show the soft tissues of the spine. The pictures show slices of the area imaged. The test does not require a needle or dye. A computed tomography (CT) scan may be ordered. It is best for evaluating problems with the vertebral bones. It is a form of x-ray. Sometimes, it may require dye into the spinal canal fluid so that the spinal cord and nerve root anatomy is identified better. When dye is injected for this purpose, the technique is called a myelogram. SPECT stands for Single Photon Emission Computed Tomography. It is a nuclear scan because it uses a radioactive tracer, Technetium. Technetium is injected into your vein. Where there is increase in metabolic activity, such as in the case with inflammation (arthritis), fracture, infection, or tumor the Technetium will be more concentrated. Electromyogram (EMG) and/or or nerve conduction velocity (NCV) tests are performed by the placement of small needles in extremities where there is concern about change in motor function, or sensation. By using low-level electrical current, the device measures whether or not a motor nerve is being compressed. It can also help determine the source of changes in sensation. The EMG tests the muscles to see whether they are working properly. If they aren not, it may be because the nerve is not working well. The NCV test measures the speed of the impulses traveling along the nerve. Impulses are slowed when the nerve is compressed or constricted. If symptoms limit your ability to function normally, your doctor may suggest an injection into the spine to help with pain. Your doctor may recommend facet injections into the joints of the spine. A procedure called radiofrequency ablation may provide more lasting benefit. Epidural or transforaminal injections into the spine can also be helpful. A series of injections may be more helpful to provide temporary decrease in pain. If you have osteoporosis, discuss with your doctor how you can optimize your treatment for this condition to slow the progression of osteoporosis. Adequately treating the osteoporosis can help reduce the progression of the scoliosis. Surgery is usually considered when non-surgical treatments have not provided enough relief from pain - or when the nerves of the spine are being damaged. Surgery is more common when the curvature is continuing to increase and the imbalance of the spine is clearly getting worse. Surgery to correct adult degenerative scoliosis is both complex and difficult. Most surgeons would not suggest surgical intervention except as a last resort when all conservative measures have failed and the pain is intolerable. Adult degenerative scoliosis is a disease of older people. As a result, the overall health of the individual is important when making decisions about whether or not to consider surgery. Other illnesses, such as heart disease, lung disease or diabetes, may increase the risk of medical complications either during or after the operation and make surgery too risky. Surgeons must consider the quality of the bone of the spine as well. Older individuals are more likely to have some degree of osteoporosis. This makes the bone weaker. Weaker bone may not be able to hold the instrumentation, the rods and screws necessary to correct the spine. If the bone weakened by osteoporosis cannot hold the screws necessary to hold the spine aligned as it fuses, this can lead to failure of the entire operation. The goal of surgery is to improve the balance of the spine and remove pressure on any of the nerves of the spine. Surgery to relieve pressure on the nerves is called a decompression. Surgery to reinforce the area that is unstable is called a fusion. To accomplish the goals of the surgery requires several steps. First, the surgeon must be able to adequately see the area of spine to be corrected. This is called the exposure. The surgery usually requires an incision in the back. In some cases, surgery will also need to be performed on the front of the spine. This may require an incision in the abdomen or from the side of the body to allow the surgeon to reach the front of the spine. Sometimes a combination of both is necessary. Next, the surgeon must perform a decompression so that all nerves are free of any pressure. This is accomplished by removing any bone spurs or disc material that is causing pressure on the spinal nerves. The surgeon must then mobilize the spine. Usually after the decompression is finished, the spine is mobilized a great deal. Removing bone spurs and disc material also loosens the contracted scar tissue around the spine and allows the surgeon to straighten the spine back toward normal. Finally, the surgeon must insert the screws and rods that will hold the spine in the new position while the fusion occurs. Two special screws called pedicle screws are inserted into each vertebra. These special screws are then attached to metal rods that hold the vertebrae in alignment. Bone graft is placed between each vertebra. This bone graft will form a solid bone bridge between each vertebra and allow the spine to grow together - or fuse. The combination of the pedicle screws and the metal rods is called the instrumentation. This instrumentation forms the strut that will hold the spine in the correct alignment until the spine fuses. Once the spine has fused, it will remain in the balanced position. The instrumentation is no longer really necessary, as the fused bone of the spine is now what is keeping the spine from collapsing again. The instrumentation is rarely removed and only removed when it is causing a problem. Restoring balance to the spine should decrease pain and reduce the risk of future problems.